The development of Catholic Medieval Universities occurred over the span of a number of centuries. It was a great enterprise that revived the ancient institutions of learning of Athens and Alexandria but under the auspices of the Catholic Church and Catholic Monarchs. The Christian confidence in reason and the harmony between reason and faith enabled the development and growth of these institutions. With the increase of the members the students were divided in groups by nations and a Procurator or Proctor headed each group. Something similar had been done in Athens. The University of Paris and the University of Vienna were divided each into four nations. Oxford only had two nations: “the north English, which comprehended the Scotch; and the South English, which comprehended the Irish and Welsh.” The office of Proctors at Oxford derived from this. At different universities the heads of the universities were called Rector, Chancellor or Provost. At first the head of a university taught students but as the sciences increased the instruction was left to Doctors who taught a given science. This was the origin of Deans of Faculties. Newman enumerates the characteristic distinctions between public or grammar schools and of universities made by Bulaeus (César-Egasse du Boulay), a 17th century historian and rector of the University of Paris. 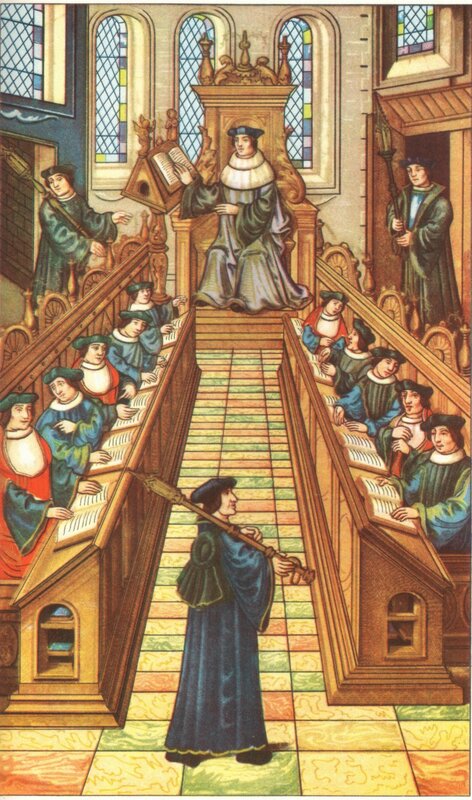 The public or grammar school founded by Charlemagne and the universities into which some eventually grew differed in that in the latter, Medicine, Law and Theology were added to the seven liberal arts. The latter or Schola Majores were only located in the great cities and were few in number. Locations that were salubrious and beautiful were chosen as the site for universities. Another difference between public schools and universities is that Popes, Emperors and Kings were the founders of universities whereas lesser authorities in Church and State were the founders of Colleges and Schools. Another distinction according to Bulaeus were the privileges associated with universities: “Patrocinium” (or patronage) and “Praemium” (or awards). Lastly, the greater and lesser schools differed in their government; the colleges had one head while the university were governed by the community of scholars that constituted them. With this sketch Newman summarily enumerates the subjects, faculty members and characteristics of the Medieval Universities which were Christian in origin and can still be recognized in contemporary universities, religious or secular.